This extra large pillow is perfect for those who prefer to sleep predominately on their side throughout the night. 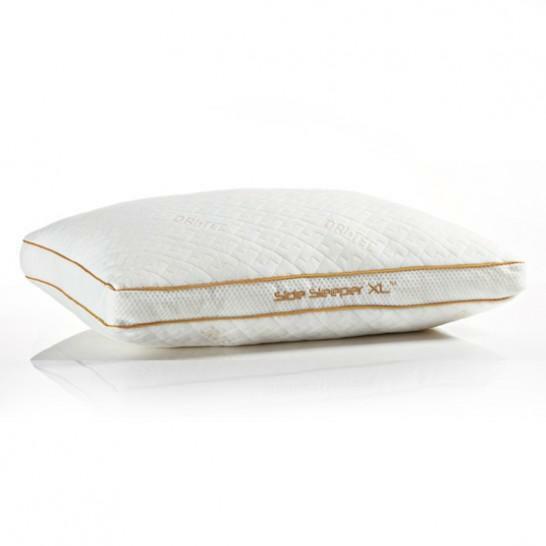 Comprised with a unique down-alternative hypoallergenic fill, this pillow is filled with extra loft to create a firm and buoyant fit for wider torsos and shoulder spans, which creates the support side sleepers. Metallic corded seams and unique mesh gusseted sides for the most advantageous airflow possible. The shock absorber inner covers propel and expel moisture and heat through the Air-X™ fabric, returning cool air flow through to the sleep surface powered by Dri-Tec® surface fabric which transfers heat and moisture away from you during your peaceful slumber. The mesh sidewalls contain a filter fabric which reduces allergens from the environment entering your pillow allowing for a fresh and restoring night’s sleep. The Align Queen XL Align Position Pillow for Side Sleepers by Bedgear at Stoney Creek Furniture in the Toronto, Hamilton, Vaughan, Stoney Creek, Ontario area. Product availability may vary. Contact us for the most current availability on this product. The Align collection is a great option if you are looking for Bedding in the Toronto, Hamilton, Vaughan, Stoney Creek, Ontario area. Browse other items in the Align collection from Stoney Creek Furniture in the Toronto, Hamilton, Vaughan, Stoney Creek, Ontario area.